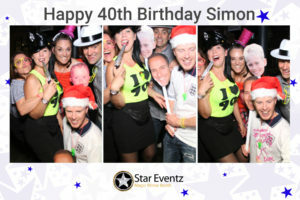 For the May Bank Holiday weekend, Star Eventz UK brought the Magic Mirror, otherwise known as the Selfie Mirror Booth, to Sheffield UK for another great event to celebrate Simon Shepherd’s 40th Birthday. Simon’s Party was held at the ever so trendy Tamper Coffee Bar at Sellers Wheel in Arundel Street, Sheffield. This was a 19th century building with a red brick vaulted ceiling which used to be a former silversmith in Sheffield’s cultural quarter, renowned for its’ coffee, teas and fresh juices. The kitchen opens late on Friday and Saturday nights serving good quality food, cocktails and craft beers. The Magic Mirror Photo Booth took centre stage on Saturday night and was very much enjoyed by the young children that attended the minute the photo booth was switched on. 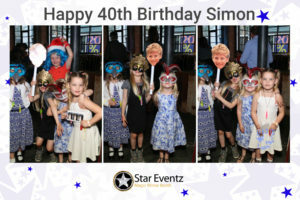 This was great for the parents because they had a baby sitter for the whole event and something to keep everyone entertained whilst capturing some great memories. The adults then cottoned on to what this big full-length Mirror Booth was all about and it was great to see how many guests had never seen or heard of this piece of equipment so it was such a joy to watch. Everyone then discovered the many great props that were on offer for the night and then went into overdrive. At one point a member of Simon’s family tearfully said to me this was such a great idea made even better by seeing all of her family genuinely laughing and smiling with each other and she thanked us so much for bringing it to the party and making it so much fun. We take great pride in making people happy so this was great for us to hear and see everyone having so much fun. At Star Eventz we pride ourselves on being a great reputable company who are friendly, reliable and nicely priced to ensure that you’re getting the best quality service and product that exceeds your expectation. We always ensure that you will not be disappointed with the experience and product you get when you book with Star Eventz UK. 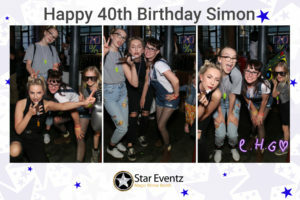 Star Eventz UK are a Nottinghamshire based company that cover the whole of the Midlands and always seem to leave customers wanting more or to book one of our Magic Mirror selfie booths for their own event. 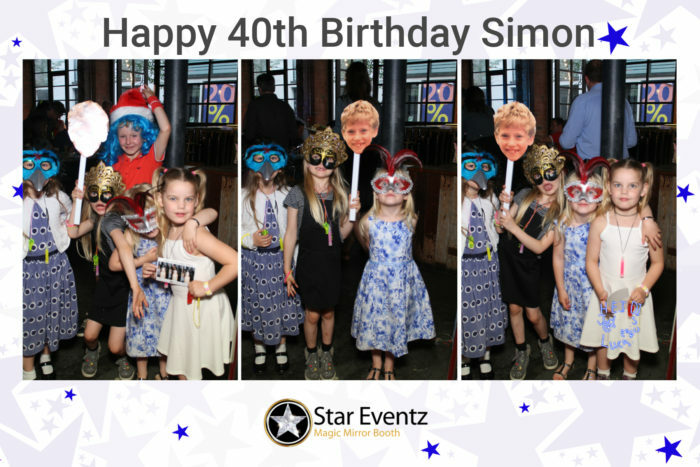 Continuing the pattern at Simon’s event, many people requested a card or leaflet to book us and our selfie mirror in the future so we can only imagine it went down very well with Simon and his guests. The staff at Tamper were amazing, especially Lidia who helped accommodate our equipment and was always available to jump in to help when ever needed, she works so hard and is very passionate about what she does. Simon the host was very happy which the outcome and couldn’t thank us enough for making his night such a success. He brought some of his own props too which included home-made hold up masks of him at different stages of his childhood which looked very impressive indeed. As always, we very much enjoyed the night too, there was a great atmosphere, great guests and a great location. We cannot recommend Tamper Coffee Bar as a perfect venue enough, it was just excellent! We are hoping to do many more nights in and around Sheffield soon, especially at this location. Star Eventz can offer you a package that is guaranteed to give you and your guest a night or day to remember. We can tailor your photos to to suit the event or theme, add Video messaging, provide you with a guestbook, fun backgrounds, GIF images and more. Star Eventz only use the best technology along with a superior quality DSLR camera and lab standard printer. Our photos are printed within seconds and can be instantly handled because we use a dye sub printer, so no smearing when you handle them! Images can also be instantly uploaded to Facebook or Twitter which means guest can have them uploaded to their smartphone within seconds. Want to Book The Star Eventz Magic Mirror Booth for your Event?